... I was sliced open and a squirmy, slimey 3 lb. 14 oz. baby was removed from my abdomen. My husband and I were petrified; the baby wasn't due until Christmas Eve. But he was in a hurry and didn't want to wait. He's still a lot like that. Plus, knowing him the way I do now, I'm pretty sure he thought he might score a lot of candy by being born on Halloween Eve. That tiny little hatchling has become a stringy burst of energy with a tuft of spikey blonde hair, gorgeous blue eyes, and a heartwarming smile. He's smart, funny, and athletic. And best of all, he's kind. He's a wonderful big brother and always tells me he loves me when he leaves the house or hangs up the phone. He's the last to let go of a hug. He's my #1 son (though when I tell him that, I always add that I saved the best for last. : ) ) And he's one of the great loves of my life. Happy Birthday, Truman. 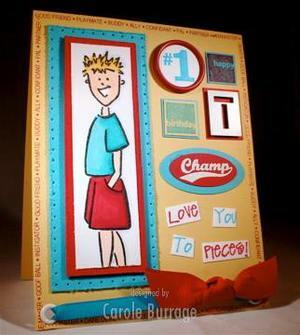 Truman's card was made using the colors from today's Color Challenge: Tempting Turquoise, So Saffron, and Real Red. He was colored in with Copic Sketch markers, and the "Champ" sentiment was heat embossed with white detail embossing powder. Supplies used -- Stamps: Sporting and Short Order numbers by SU!, Dude by Close to My Heart, Love You To Pieces by Gina K. Designs, Borderline: Family Ties by Technique Tuesday; Paper: So Saffron, Tempting Turquoise, Real Red, Nena Crest Solar White; Ink: Real Red, Tempting Turquoise, VersaMark, Brilliance Archival Graphite Black; Accessories: Ribbon, eyelets, paper piercing tool and Mat Pack, Tonic paper distresser, Huggerz (I think that's what that red thing is called), white detail embossing powder, metal T from Joann's, 3-D Dots, oval punches. By the time I closed down the house and got ready to get in bed this evening, DH was snoring. I figured he wouldn't miss me if I checked to see whether the Limited Supply Challenge for Friday had been listed. Low and behold, it had, and it was a pretty simple one: Quick and Easy DP. In other words, we could use designer paper, cardstock, a sentiment stamp and border stamps, any embellishments, but no image stamps. How could I go back to bed, I ask you?! Supplies used -- Stamps: sentiment by Hampton Art Stamps, corner border flourish by Technique Tuesday; Paper (SU! 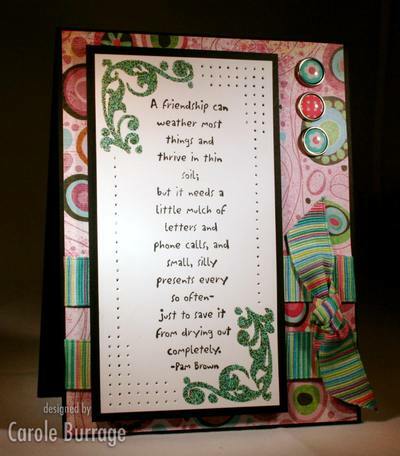 unless otherwise noted): Whisper White, Basic Black, dp by Basic Grey; Ink: Basic Black, VersaMark; Accessories: Page Pebbles by Making Memories, ribbon, turquoise embossing powder, paper piercer and mat pack, Crop-a-dile.